Microsoft has officially announced the Kinect for Windows SDK, opening up a world of possibilities for developers to create new apps, tools and games for PCs. The new SDK, set for Beta release on May 16th, will give third parties access to the bare-bones tech that saw the motion-sensing peripheral become the fastest selling consumer device of all time. The headline feature of the SDK seems to be access to something called "robust skeletal tracking" which allows the tracking of one or two persons within the Kinect sensor's field of vision. Developers will also get full access to Kinect's advanced audio capabilities, which Microsoft says will include "four-element microphone array with sophisticated acoustic noise and echo cancellation for great audio." There's also be integration with the Windows speech recognition API included as well as "beam formation" to track where the sound is coming from, along with full access to Kinect's camera tech. Since its launch back in November this year, Kinect has seen some inspired software hacks so it'll be fascinating to see how developers fare having officially been given the green light to create new tools. Microsoft also announced that it'd be giving each of the developers at the MIX11 forum in Las Vegas a Kinect box to go away and create stuff with. 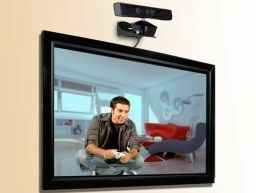 Developers can sign-up to be notified of the release of the Kinect for Windows SDK here.